SUNNYVALE, Calif. - Nov. 7, 2016 - PRLog -- Salesforce is known to be one of the most vigorous CRM systems. A cloud-based customer relationship management software solution for sales, it is popularly used by developing companies and developed companies alike seeking sales management. In the list of top 25 Salesforce Leaders to follow on Twitter and LinkedIn, many renowned names were mentioned such as that of Marc Benioff, Chairman and CEO of Salesforce, Natalia Burina (Director of Product Management at Salesforce) et al. The name of Mr. Pratyush Kumar, co-founder of Algoworks which is a certified Salesforce partner company, featured in the said list. The 13,000+ strong Salesforce forum on LinkedIn 'SALESFORCE PARTNERS AND PROFESSIONALS - DEVELOPERS | CONSULTANTS | ADMINISTRATORS | ARCHITECTS' run by him is devoted to initiating partnerships and relationships via professional alliance for companies using Salesforce. The forum focuses on sharing and promoting knowledge among SFDC developers. "I am delighted to have featured on the list with some of my favorite names also on the list some of which had been the motivating guidance in my pursuit of understanding and mastering the salesforce.com technology." said Pratyush. 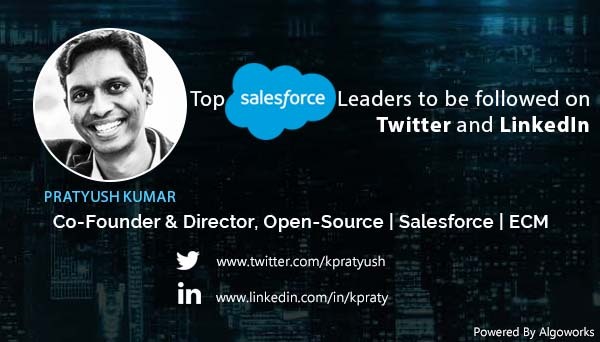 His Twitter (@kpratyush) and LinkedIn account is followed by a large number of leaders and professionals associated with Salesforce. Mr. Pratyush is also known to be a regular attendee of Dreamforce, a Salesforce mega event held annually. Algoworks is a global IT services provider headquartered in Noida, India. Pratyush heads the company's US operations from Sunnyvale, California. The company was founded by Mr. Pratyush along with two other associates in 2006. Being a certified Salesforce partner, Algoworks excels in providing Salesforce CRM solutions, apart from other development, customization and testing services in the fields of mobile application development and enterprise content management software. Algoworks' Trip To Jaipur: The Pink City!